What is the Faculty Staff Annual Campaign? 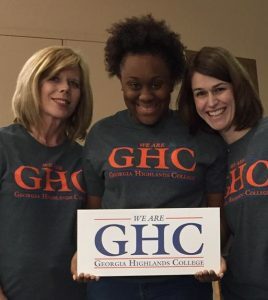 The Faculty/Staff Annual Campaign provides GHC employees an opportunity to become engaged and involved with the fundraising effort in support of GHC’s students, faculty, staff and programs. Annual Gifts of all sizes have a huge impact on a student through scholarship support. Your gifts provide critical revenue that support the college’s priorities and make a significant difference on all our campuses. Why should I give to GHC? Your donation is an investment in our College to better lives and our community. Your gift helps students take a full load of classes, afford books and fees, and stay in school for consecutive semesters. Employee giving is crucial for fundraising, especially when meeting with potential donors. Strong employee participation shows that our workforce is invested in GHC. Can I specify where my contribution will go? YES. The choice is yours. If you prefer an alternative to unrestricted giving, you can designate your gift to any of the foundation’s endowed scholarships, the general scholarship fund, or athletics. Ways to Give – There are several ways to make a contribution. Open-ended Pledge – complete a faculty staff campaign form and choose option 2. Fixed Pledge – complete a faculty staff campaign form and choose option 1. Send a personal check made payable to the GHC Foundation, Inc.
Make a gift of appreciated securities, such as stock. Please contact the Office of Advancement for more details regarding securities and/or stocks. Will I receive a year-end tax receipt from GHC? The college is a 501(c)3 organization, and all gifts to the Faculty/Staff Campaign are tax-deductible to the extent allowable by law. All donors will receive a letter to be used as a receipt for tax purposes.